The Lady Statesmen of Delta State closed out a win at their home invite Monday, powered by an NCAA Division II record from Anastasia Klyarovskay in the 200 back. That added to the six school records Klyarovskay, a freshman, broke for Delta State at the invitational. Fellow freshman Melanie Tombers added another school record Monday. Lindenwood took home the win on the men’s side in a dominating effort for the Lions. The team score portion of the meet is over, but it appears that two sessions will take place Tuesday in a long course meters meet. Klyarovskay was a major force for Delta State in the final night, winning two events just like she did Sunday. After winning the 100 fly and 100 back on day 2, Klyarovskay returned to win the 200 distance of each stroke Monday. Her 1:56.44 in the 200 back was a new NCAA record at Division II and set up a 1-2 finish for Delta State, which saw freshman Kierstin Page take second. Both got in ahead of Limstone’s Rachel Hickey, who finished third after breaking a school record in prelims. Klyarovskay also won the 200 fly in 2:03.88, followed by sophomore teammate Danielle Dugas in another Lady Statesmen 1-2 finish. Though West Florida didn’t win either race, they set school records in both. Freshman Savannah Antonetz went 2:08.60 for a new school record in the 200 back, while Allison Lehr was a school-record 2:08.30 in the 200 fly. The Argos did win two events – the 100 free and the 400 free relay. Peggy de Villiers went 50.96 to win the 100 free after taking the 50 earlier in the meet, then joined Anna Macht, Emily Mitchell and Carla Robles to win the 400 free relay in 3:28.46. Both times were new West Florida school records. One more West Florida school record went to Karisa Kostecki in the 1650 free (17:56.60). That 1650 race was won by Alecia McGillivray of Lindenwood, who dominated the distance races this weekend. She went 16:55.63 followed closely by teammate Kyleigh Troxel, just as she was in the 1000 free on Sunday. 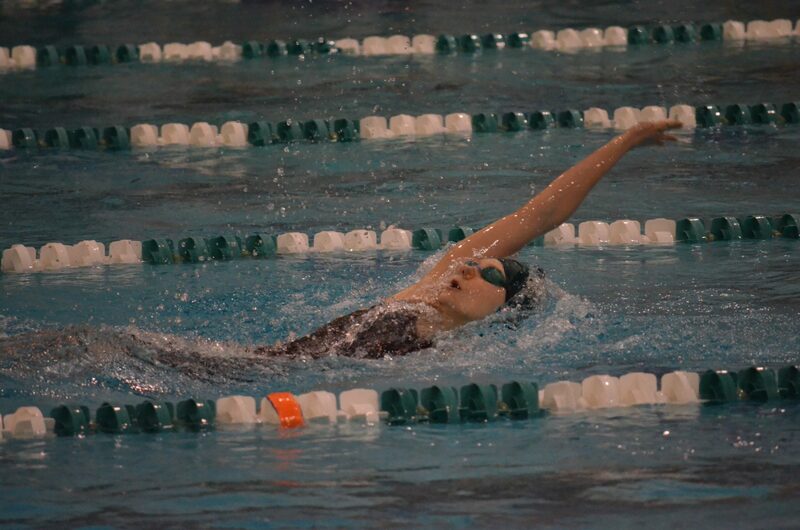 The 200 breaststroke win went to Melanie Tombers, yet another Delta State freshman having a fantastic meet. She broke a school record here after already breaking three the past two nights. Tombers was 2:16.95. Lindenwood picked up two more wins in what’s been a dominating weekend for the Lion men. They went 1-2-3 in the 1650 led by Gustavo Silva Santa‘s 15:24.82. He was followed by Sylwester Borowicz-Skoneczny and Igor Mijatovic. Lindenwood also got a 200 breast win from Mateusz Pacholczyk, who went 1:58.36, the only swimmer in the field under two minutes. Delta State saw two men sweep their respective strokes at home. Yvan Nys broke a Statesmen school record in the 200 back, going 1:46.63 one day after winning the 100 of the same stroke. Not to be outdone, 100 fly winner Vlad Zinca went 1:48.69 to win the 200, completing his sweep of the butterflys. Limestone College got a win in the 100 free, coming from Sean Gunn. He went 44.93 to power away from the field. In addition, Limestone sophomore Denis Schulz broke a school record in a 4th place finish in the 200 back, going 1:50.67. The final 400 free relay went to Missouri S & T, its second win of the weekend. The team of Luke Norris, Al Kerc, Keith Sponsler and 200 free champion Jonathan Glaser went 3:00.55 to just beat out Lindenwood’s 3:00.89. Delta State has one of the best (unofficial) school mascots – they’re the Fighting Okra! I remember when the Fighting Okra came and visited the pool at the NSISC meet my freshman year. Fantastic.